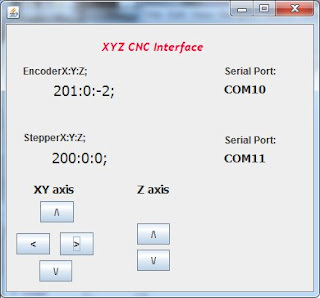 Arduino XYZ CNC Java GUI is working! I was able to expand the GUI to talk to two serial ports at once. I have the Arduino reading the serial encoders on COM10, and the Arduino with the motor shields on COM11. Both Arduinos print back their coordinate to the serial port. The positions are read back from the Arduinos to the GUI display. The buttons fire off HPGL PR commands to the Arduino HPGL interpretor. w00t! The machine moves, the encoders increment. Next step is to add some flow control to the GUI and the ability to spool in a large HPGL command in small chunks so as not to overflow the Arduino serial buffer and give it time to move from point to point. Not sure if this is the way I will go, but I'm exploring using Java to create a small GUI to control the Arduino based XYZ CNC machine. I did see some folks have already done this, so I may go back and use their code. This is a place to store my notes as I explore this topic. My hardware is an Arduino with two motor shields from Adafruit attached (see my post on modding the shield to stack) and another Arduino reading three rotary encoders (see my post on this). These control a Zen toolworks 7x7 CNC machine. I've written the code for the Arduino to respond to serial commands to move in straight line at constant velocity from current location to a new location. Ideally this is all that ever needs to run on the Arduino. I wrote a simple HPGL interpretor, but the serial communication wasn't working out. When I used the Arduino GUI to dump a serial file to the Arduino, the Arduino did not process the commands fast enough, obviously it has to move motors, etc, and the serial input would overrun the input buffer in the Arduino and trash the data. The Arduino can't do this job all by itself. i will never be able to send a whole HPGL file to the Arduino, it needs to be passed a bit at a time by a PC program. So the goal here is to write a GUI that will allow the PC to feed the Arduino a file a bit at a time, and also have manual buttons to move the motors and display the encoder postions. Maybe even the limit switches. All the arduino will do is move from X,Y,Z to X,Y,Z point as commanded. To use that, download javax.comm for the 'generic' platform (which provides the front-end javax.comm API only, without platform specific back-end implementations bundled). Then acquire the Windows binary implementation rxtx-2.0.7pre1 from http://www.rxtx.org. Points to the same oracle page that got me only comm.jar. hmmmm. And rxtx.org points to a isp dead end page. Instructions were similar, but now i had a jar file and a dll. Bleh, not really sure how to use this with netbeans. README talks about ant in linux. also a GUI form that goes with it, but nothing earth shaking there. OK - found that right click on Libraries in the project tree, hit properties, brings up the GUI to remove the broken links. Still missing java.boot.jar looks like i can ignore this. Complains the port doesn't exist. So changing the port to "COM11" where my Arduino is and error goes away, but the form flashes up then disappears immediately from within Netbeans, Duh - the arduino app was open and the port was busy. Closed it and things are looking up! OK, some success. The console window shows the responses from the Arduino. The form is not working but at least it is talking to the Arduino from the Java console!!! w00t! Have the very basics of the GUI working now by splicing together demo GUI program with the rxtx. I can push a button on the GUI, send a 'U' to the serial interface and turn on the LED. Awesome! 'D' turns it off. The port initialization was stolen directly from the code i posted further up. The Arduino sends back the position and the GUI displays it. Left a place for the encoders to read back, that requires more work from a second serial port. Using the basic GUI builder in Netbeans. The form is just made with the form builder and the functions pasted into it's fields. I'm in business. Now the drudgery of making the full GUI, passing coordinate messages, spooling a HPGL file, etc to the real Arduino stepper motor control program. I'll spare some details until I have a more complete interface put together and write that up. Here is the Java and the Arduino programs. 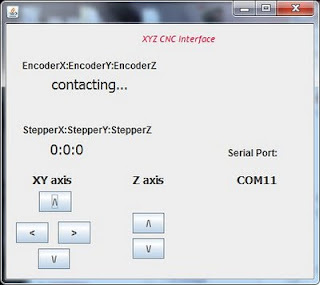 Working on control software for the CNC machine. Wrote a basic program to do linear interpolation from coordinates received over the serial interface. Now I need to find an easy way to send coords from a graphics program. Trying to decide what I need to write so that I can communicate with some open source machine control software. The Arduino can't do a lot on it's own, but it needs to interpret commands. Many graphics programs can output HPGL. This will be for mostly 2D projects, like PCB cutting. The bug i have right now is that if i send the very long coord lists in this file, i fill the Arduino serial buffer and it hoses the data, since the Arduino has to move the motors, reading the data as it comes doesn't quite work. Meanwhile this is what i have so far, that works will with manually entered commands. //make sure there is enough data there for form a command, at least "IN;"